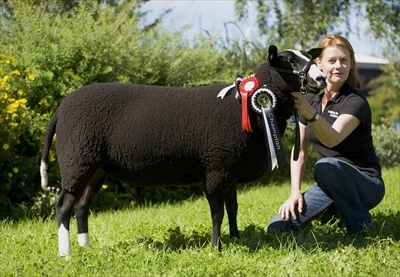 Harrrison and Hetherington held the eighth annual show and sale on behalf of the Zwartbles Sheep Association. After the previous evenings successful show of quality sheep the mood was upbeat and the sale kicked off with a packed ringside of people from near and far. Beginning with three flock ewes bidding started well with a top of 250gns for A Baillie and T Jacksons Tardoes bred ewe (lot 3) selling back to its original breeder M Simpson Kilmarnock. Average £178.50. The sale then moved on to the rams where with the large number forward trade took a dip with buyers being selective and many being tricky to sell. Kicking off with the aged rams only two out of three were sold at a top of 380gns for (lot 220) from A Baillie and T Jackson selling to CJJ and JC Cookson Kendal and for (lot 223) from J Erskine 360gns selling to SR Plum Darlington. Average £388.50. Ram lambs continued the trend in the male section with many lots being hard to sell topping the trade at 1020gns was a lamb from C and S Rae Dumfries Wallacetown Woodward (lot 354) selling to J Wyille and Grandaughter Grange Over Sands. Followed by two at 1000gns including the Reserve Male Champion from T and S Donnelly Canonbie Saltur Willford (lot 289) selling to C Gammage Lanark and Broomhill Wiznaeme (lot 308) from L and J Strawhorn selling to JA and R Geldard Kendal. Average £329.78. A small number of non mv shearling ewes were forward these selling to a top of 190gns (lot 359) from Mr and Mrs P Harsley and 160gns (lot 360) from the same home selling to RE and LM Harker Harrogate. Average £153.00.